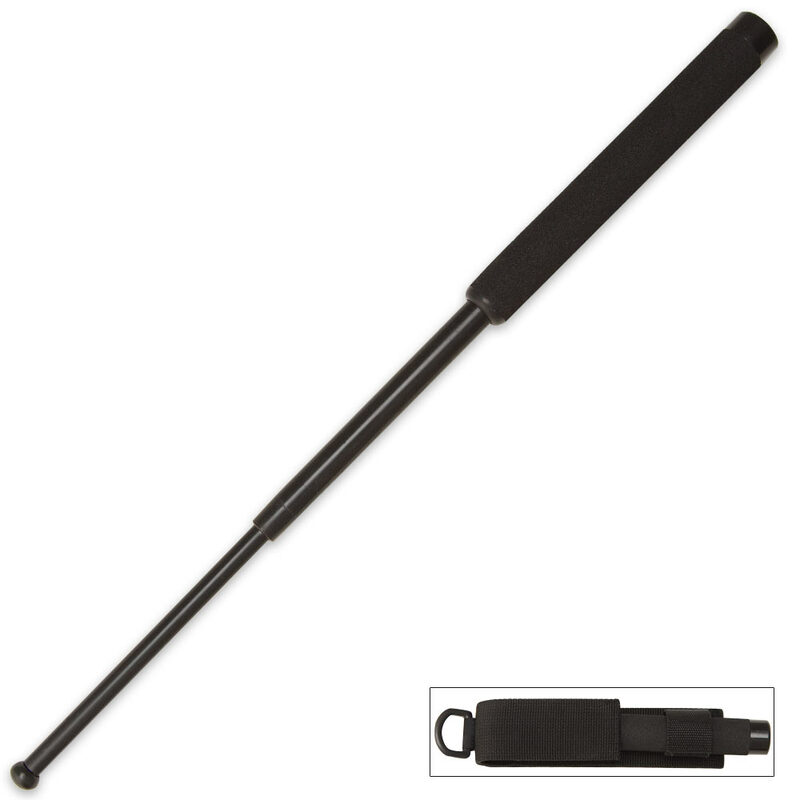 Black nonglare coated steel shaft. Rubber handle with diamond grip. Includes nylon pouch. 16" overall. Not the best baton I've ever had, but not bad either! For the price it's definitely a good buy! I recommend a light spray of wd40 and it'll help it close back up easier. Size is nice too, not too heavy or bulky! Good enough to serve it's purpose. Even if it bends or breaks during the first use, it should be enough to stop 1 or 2 attackers. a pain to retract, but retracting isn't the primary purpose. Good for the price. very satisfied with my purchase. true swords continues to impress with their products. great baton, small compact and packs a punch. great for self defense. swift arrival and well protected. a bit too tight but still usable. Placed order on Monday afternoon & got it the next day by 9.am. Amazing delivery time. Got my order within the week and is very satisfied with this product. Excellent and very sturdy. When retracted...it's short enough to conceal in your pocket, got just the right weight to swing and deliver a crippling blow to your attacker. Very intimidating too---when snapping your wrist/arm to extend it! It may be hard to retract once opened--but at least you can be sure that it won't retract once in use! You'll never go wrong with this one. Overall---an A+++ product from True Swords! Thanks! I got the discount and it was worth that price. Good Self Defense and i carry this in my Truck but more than likely ide use my fist before i resort to Weapons for self defence i have military training for that purpose. Good Gift tho.